Blurb Description: In this breathless third installment to Victoria Aveyard's bestselling Red Queen series, allegiances are tested on every side. And when the Lightning Girl's spark is gone, who will light the way for the rebellion?Mare Barrow is a prisoner, powerless without her lightning, tormented by her lethal mistakes. She lives at the mercy of a boy she once loved, a boy made of lies and betrayal. Now a king, Maven Calore continues weaving his dead mother's web in an attempt to maintain control over his country—and his prisoner.As Mare bears the weight of Silent Stone in the palace, her once-ragtag band of newbloods and Reds continue organizing, training, and expanding. They prepare for war, no longer able to linger in the shadows. And Cal, the exiled prince with his own claim on Mare's heart, will stop at nothing to bring her back.When blood turns on blood, and ability on ability, there may be no one left to put out the fire—leaving Norta as Mare knows it to burn all the way down. 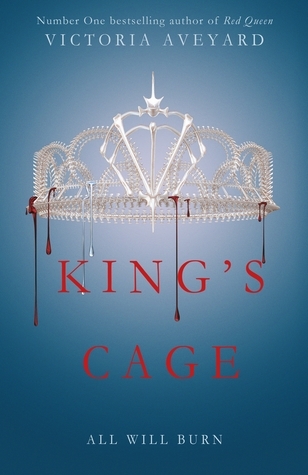 I’ve seen a lot of people complain that King’s Cage was by far the slowest installment of the Red Queen series, and they’re not wrong. I actually went into the book knowing that it was going to be a slow book, and so it wasn’t a shock to me at all. While it definitely was different from the fast paced, heart shattering power and politics I’ve come to expect from this series, that doesn’t mean I didn’t understand why it happened. Truth be told, with everything that happened in the last two books, it is understandable that these characters needed time to refocus, and gather and find themselves in a world completely different from the ones they knew. It felt like a much needed breather, in the grand scheme of things. Also, I can honestly never fault this series for anything because it feels like HOME to me. I fell in love with in two years ago in Australia as I stayed up in the middle of the night to see the shocking betrayals and power games. I got the opportunity to read an ARC of book two seven months later and I spent one of my last school days before the exams began devouring it. And now, a year and a half later, I finally flipped open King’s Cage. 1. The ending of the last book KILLED me. 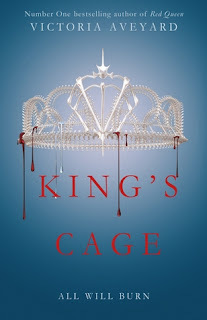 It made my already wounded heart shatter completely and I was VERY excited for King’s Cage. I literally DREAMT about the book, Corros prison and all my favourite characters inside it after I finished it. 2. If it’s not well known by now, Maven is my heart in this series. It’s like I always say, point me to the worst boy in the entire series and he’s probably the one I’ll fall for. Like Aeduan in the Witchlands series or the fact that I was Team Darkling in the Grisha Trilogy. He was the star in this book for me, as we learnt more about his relationship with his mother, Elara, and his dark, twisted and brilliant mind. 3. Sorry Mare and Cal shippers, I totally oppose you. I don’t REALLY ship Mare and Maven either, because I don’t know how he can ever redeem himself in her eyes, but I’ve never shipped her and Cal. It’s like the book said, Cal can’t ever make decisions, making him such an insufferable puppet. He’s also sort of a bore and MEH. 4. I ADORED THE POLITICS IN THE BOOK. Well, maybe adore is the wrong word, but I’m definitely in awe. This book took things to a continent-wide scale, and the moves and counter moves each side of the multiple sides in this war were subtly told and so well plotted out. 5. I liked that the viewpoints kept switching. A majority was still Mare, but we also got to see things from Cameron’s and Evangeline’s points of view. It gave you more insight into different parts of the Power Game being played and a more holistic view of the book itself. 6. I’ve never been a fan of Cameron. She feel like a secondary character put there SOLELY for the purpose of her Newblood Ability, and hence I don’t really want to get to know her. 7. I WANT MORE MAVEN. I WANT A MAVEN VIEWPOINT IN #4 AND I ALSO WANT A MAVEN FILLED PREQUEL NOVELLA. I honestly feel like it’s necessary because we need to get into this boy’s head to truly see all aspects of the story. Plus, he’s my squishable broken prince shaped cupcake and I need everything that has to do with him. 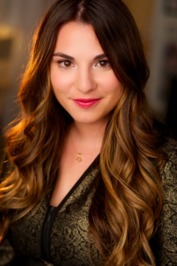 Here’s to hoping that I wake up tomorrow morning to Victoria Aveyard announcing that the final book comes out on that day because I NEED IT. NOW. One of the best young adult fantasy series’ out there and if that’s not enough, I don’t know what will be. Have you read the Red Queen Series yet? What do you think of it? Who are your favourite characters in this series? Are you a Mare and Call shipper or do you ship her with Maven?